« Hot! The Weather Certainly Is! At least two days in a row of 100 degree temperatures and probably at least a couple more in the works! Maybe into the mid to lower 90s later next week. Yeah! Also see a chance for rain maybe by Sunday. No change in the generation schedule. Off in the a.m. and on by noon or 1:00 p.m. Two units to start then 1-2 hours later, two more units. Lots of water. Stan on the water half a day last Monday with Bill from Illinois. 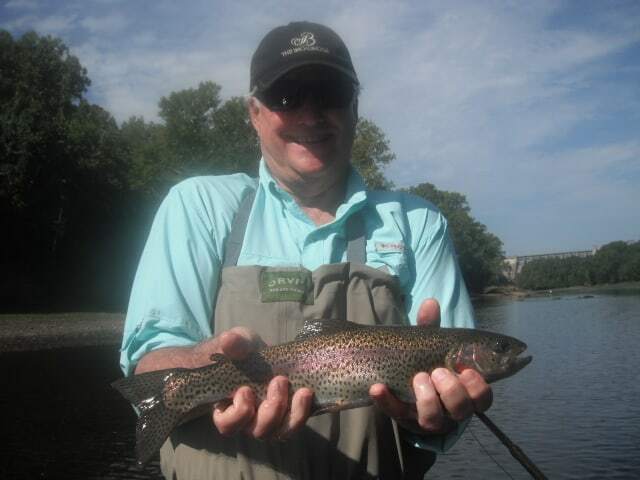 Bill caught a few on a black soft hackle, but more were on either the P&P or Lil Ruby midge. Carolyn had Ron and Sharon out again. This day, we did not have any really good pattern. A few on a gray scud, a few on the P&P. The rise was pretty fast and furious so that did not fish well for us. Tuesday it was a group from Texas that we have been taking out almost every year. I think Stan’s boat took the prize for biggest fish with a 17″ rainbow (Alex and Chase. Dana’s boat with Rick and David, took most fish to the boat with mainly on the tan b-bug. They also landed some on a size 16 tan scud and 18 copperhead black midge. 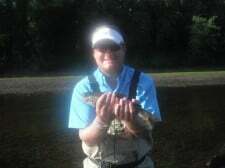 Lindi and Taylor fished with Darrell and their pattern was the P&P. Jim had Max and Beau and they took caught on the P&P and a gray scud. 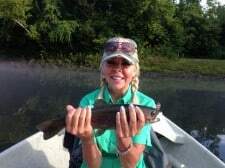 Carolyn had Renee’ and they caught a few on the black copperhead size 18 midge and the tan b-bug. Hot day, but a fun time was had by all. This entry was posted on Sunday, August 24th, 2014 at 11:29 am	and is filed under Fishing Reports. You can follow any responses to this entry through the RSS 2.0 feed. You can leave a response, or trackback from your own site.